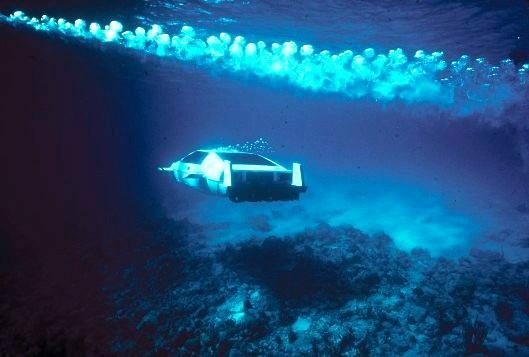 The Spy Who Loved Me featured perhaps the the second most famous James Bond car of all time, after the iconic Goldfinger DB5: the Lotus Esprit S1 that went from sports car to submarine with the flick of a switch. Now, thanks to an eBay auction, you can buy one—for a million bucks. Okay, so the movie prop offered in this auction can hardly be called a car. This static piece, fresh from a complete overhaul on the reality show American Restoration, shows the folding wheels on the left side, and the underwater fins on the right. It sits on a display platform in the same diving angle as when movie viewers first witnessed the car-to-sub transformation in theaters in 1977. As the lads at Top Gear proved, turning a road-going car into a seaworthy submarine isn’t easy. Just a little over a year ago, Elon Musk purchased another Bond Lotus submarine prop, and he says he’s going to make it functional. The Lotus lookalike is fascinating. This film was made a third of a century ago, the same year the IBM PC was released, when CGI was still science fiction. Accordingly, the film’s producers had to build a submarine that looked like a Lotus Esprit, and they hired Perry Oceanographic in Florida to do the job. Clearly they did a very good job, as the pic above attests. Roger Moore played James Bond in the The Spy Who Loved Me (1977) and For Your Eyes Only. 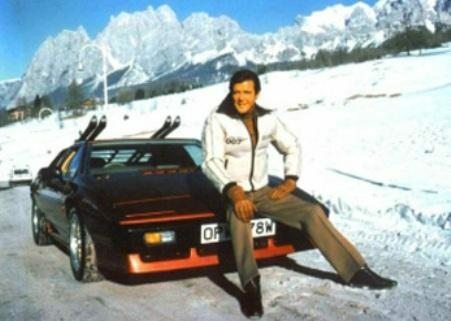 We suspect that the real automobile versions of the British Lotus Esprit S1 driven by Bond (played by Roger Moore) in The Spy Who Loved Me (1977) and the Esprit Turbo in For Your Eyes Only (1981), might command even greater prices on the auction block. That’s Moore getting instructions on the Lotus from gadgetmeister Q, played by Welsh actor Desmond Llewelyn. Llewelyn appeared in more Bond movies than even Sean Connery. 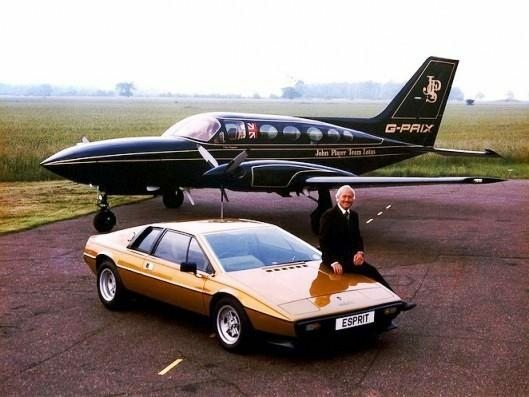 The Lotus Esprit was originally designed by Giugaro for Lotus, but when it turned out to be not quite as aerodynamically efficient as its bullet shape and steeply angled windscreen suggested (it has a cd of 0.34), Lotus supremo Colin Chapman dropped the project. Chapman (pictured below) was one of the great pioneers of automotive design, particularly in the area of aerodynamics and the Lotus brand he created retains its technological leading edge to this day. Chapman’s focus on light weight and aerodynamic efficiency saw him create one of the great Formula One teams, beating Ferrari to become the first team to achieve 50 F1 Grand Prix victories, winning the F1 constructor title in 1963, 1965, 1968, 1970, 1972, 1973 and 1978, and producing the cars which won F1 Drivers’ Championships for Jim Clark (2), Graham Hill, Jochen Rindt, Emerson Fittipaldi and Mario Andretti. Italdesign persevered with the visually-striking wedge-shaped vehicle and showed the concept at the Turin Motor Show in 1972 to great acclaim, reinvigorating Chapman’s interest and eventually resulting in one of the marque’s most memorable cars (amongst many).